BARBARADARLINg.com: 11th. March.On Line Video Festival.2016 ‘A day of tears’ /2016/3/11.Wed. 11th. March.On Line Video Festival.2016 ‘A day of tears’ /2016/3/11.Wed. Installing ‘About the person’ (2011) in 2016. On 3.11, we realized how powerless we are. Today, we are still powerless against the fury of the elements, despair in society, and the darkness of one’s mind. Still, we are alive. And we are going to live. It might be humble, but we have a sharp all-purpose knife named Art. Short video works created with this knife will be given for March 11th. 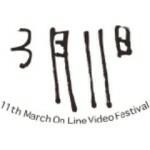 An annual online festival with short video works from 0:00 to 24:00 on the 11th of March. As the date indicates, we gather works with various thoughts about The Great East Japan Earthquake on March 11th in 2011. Participants include student, emerging, and professional artists. Along with the characteristics of the internet, we aim for an open video festival which is free from the characteristics of places of consumption or economic gain without being overeager.